How to Avoid Drowsy Driving - David M. Benenfeld, P.A. March has been named the National Sleep Awareness Month not only to bring awareness about how important adequate sleep is each night, but also to decrease the number of accidents due to poor sleep habits. In March, Daylight Savings Time happens, which means clocks spring forward, and everyone loses one hour of sleep. Most of us will shrug off that one-hour thinking you can make it up the next night or losing one hour is not a significant change for the body. However, that one hour could be vital to a safer week. How Many Drowsy Driving Accidents Occur in Fort Lauderdale and the Rest of the U.S.? Drowsy driving is becoming a significant concern in the United States. In fact, it is up on the list with drunk driving and distracted driving. Driving while sleepy or fatigued is dangerous, and there is an estimated one out of every 25 adults that fall asleep at the wheel each month, according to the Centers for Disease Control and Prevention (CDC). The National Highway Traffic Safety Administration estimates that drowsy driving caused 72,000 accidents with over 44,000 injuries in 2013. Also, they figure drowsy driving caused 800 deaths. Sadly, these numbers are grossly underestimated, because most drivers will not admit that they fell asleep at the wheel, and there is no test to determine if a driver was too tired to drive safely. Sleep is vital, and most Americans do not get enough sleep. In fact, one Gallup poll found that 59 percent of Americans get seven or more hours, which is the recommended amount of sleep each night. Out of that same group, 14 percent reported getting five hours or fewer each night, and 26 percent reported six hours. Interestingly, Americans have been progressing towards fewer hours of sleep each night. When comparing the Gallup poll, in 1942, 84 percent got seven or more hours of sleep each night, while only 11 percent reported six hours or less. Right now, four out of 10 Americans do not get enough sleep each night, which means if you are in an office surrounded by 20 coworkers, at least eight of your coworkers could have been driving drowsy to work that morning. Concentration: Sleep improves your brain’s function, including concentration and cognition – two skills you need while on the road. 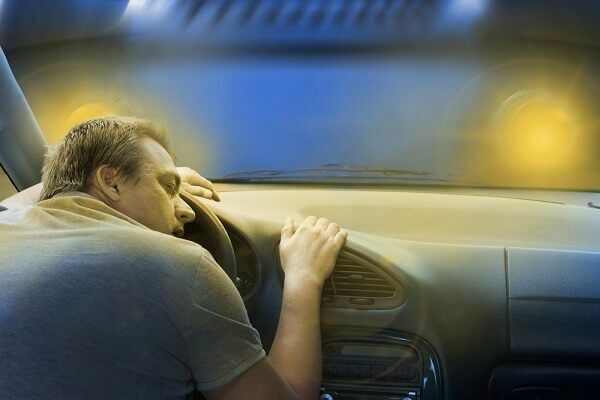 If you are sleep deprived you cannot concentrate, and you may find yourself dozing off while driving. In some instances, short sleep cycles can affect your brain like that of being intoxicated by alcohol. Heart Disease and Stroke: Certain medical conditions can be deadly on the road, including heart disease and stroke. If you do not get enough sleep each night, you may be at a higher risk of developing heart disease or having a stroke than someone who sleeps seven to eight hours each night. Road Rage: Sleep affects your ability to remain calm in stressful situations and keeps your anxiety at bay. Less sleep can increase stress levels because your brain and body are too tired to take on the added stress. In some cases, this could lead to road rage. Falling Asleep at the Wheel: You may fall asleep while driving and cause an accident. You may not even realize that you have been dozing off for a few seconds at a time. Reaction Times Slow: Your reaction times slow significantly when you are drowsy. This means that you may not apply the brakes, swerve or maneuver to avoid an accident, or even see that the light has turned green without significant delays. Decision Making Abilities are Hindered: When you are tired, multi-tasking is not something your brain handles easily. Sometimes when driving you must make decisions – some of these decisions could be critical. Lack of sleep makes it harder for a motorist to make good choices on the road. When you do not sleep well, it affects you at work, at home, and on the road. Getting better sleep each night might seem impossible, especially if you find yourself having trouble falling asleep or staying asleep. If you think you suffer from a sleep disorder, speak with your physician. Sometimes you could have an underlying medical condition preventing you from sleeping at night. Decrease light exposure at night. At least one hour before bed start decreasing light exposure. Turn off anything with a blue light, including your phone, tablet, TV, or even computer monitor. You can do this by turning down the brightness or using a blue light filter. Exercise during the day. Studies have found that activity during the day helps you sleep better at night. Not only are you physically tired, but activity affects the levels of specific hormones in your body, which might help you sleep better. If you or a loved one was injured in an accident with a drowsy driver, you have rights. Speak with an attorney from the Law Offices of David M. Benenfeld P.A P.A today. We can help you investigate the case and file a claim with the other party’s insurance to receive compensation for your injuries. Schedule a free case evaluation now at 954-677-0155 or request more information online.